The Rachel Upjohn Building – Ambulatory Psychiatry & Depression Center is a new $41 million facility at the East Ann Arbor properties for the research, education, training and treatment of those suffering from depression, and will provide other ambulatory psychiatry specialty services. The new building will provide an integrated environment and include Child and Adolescent Psychiatry, Adult Psychiatry and Substance Abuse, resulting in the co-location of the majority of ambulatory psychiatry services. The new 112,500-gross-square-foot, three-story facility will be located southwest of the existing East Ann Arbor Health Center. 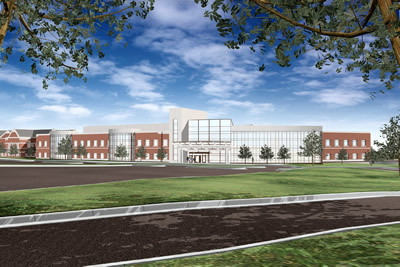 Approximately 60,000 net square feet of space will house research areas, clinics, and consult rooms and offices. Additional space will provide for the future expansion of clinical programs such as bi-polar treatment. Infrastructure improvements associated with the project include the construction of new parking spaces required to support the new facility, the re-routing of existing underground utilities and the creation of a new entry off of Plymouth Road to serve the East Ann Arbor complex.